I’m currently training for the San Diego Rock n’ Roll Half Marathon and my training for this race doesn’t really resemble any previous training periods. That’s because I’ll be 23 weeks pregnant on race day. I’ve already run 2 half marathons while pregnant (week 6 and week 12) so I’ve learned a bit about what to expect when training for a long distance running event with a bun in the oven. We’ll start with a disclaimer: All women’s bodies are different. I don’t recommend running a half marathon pregnant if you have never run one before (even if you’re run just one or two, I’d probably say you may want to reconsider running your 2nd or 3rd while pregnant since your body may not be used to the distance, but that is up to you!). I’m not a physician and all my advice here is based on my experience. Talk to your doctor and only do what is comfortable to you! Make Training Guidelines, Not Plans. Why? Because you won’t follow it exactly and that’s ok. Instead, make weekly goals such as “run 3 times a week,” or “try for a long run over 8 miles this week.” Those loose goals were much easier to meet and also easier to let go of when/if they didn’t happen. Running while pregnant is a whole different ball game – sometimes your body just won’t want to run as far as you had hoped or even at all. I hope it’s also a given that unless you are a trained professional athlete, you shouldn’t be doing any tempo runs or track workouts so a training plan would be pretty vanilla when you’re pregnant anyway. WATER WATER WATER. Any doctor (or google search) will tell you that the most important things to consider if you decide to run while pregnant is to a) run slow enough that you can have a conversation and b) drink lots of water. This also means you’re going to have to pee a lot but it’s worth it for your baby’s health and safety! Hydrate! I bring a water bottle with me during most runs over 3 miles. Be Flexible With Long Run Distance. I don’t ever go out thinking “I MUST run 10 miles today.” In past half marathon training, I’ve run up to 14 miles on a long run before the race. However, that kind of distance is unnecessary when you’re going to be cruising along at a conversational pace on race day with all the bathroom, walk and water breaks you and the little energy-zapper inside you desire. Ideally, you’ll run at least one, if not two 10 mile long runs before the race (any longer is totally optional in my opinion and likely not worth the added recovery time), but don’t expect to follow a traditional plan where you’re building the long runs and doing something like 8, 9, then 10 miles each consecutive weekend. You may not feel up for 10 miles on the day you planned it, so it’s better to try for 10 miles about a month out from the race (assuming you built up for it a bit!). 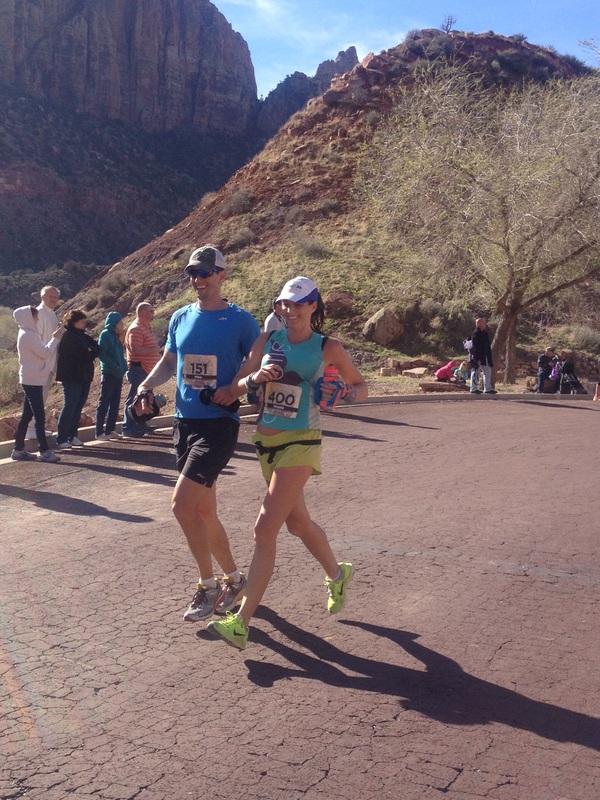 If you nail that 10 miler – great! You can do another 10 miler in a week or two and feel good about your fitness. However, if you put all your long run chickens in the 2 week before-race day long run basket and then it turns out to be 100 degrees or your legs feel like you’re pulling them through mud that day, then you’re going to either push yourself too hard in a last ditch effort to complete the 10 miles (BAD) or you’re going to skip it all together and never get in a 10 miler (better, but ideally you’ll get one in!). Plan an Escape Route. Ideally during any run, you’ll plan a route that allows you to cut things short if need be (treadmills are probably a late in pregnancy best friend especially with a child playing monkey bars on your bladder). Also, plan a route with lots of bathrooms! If you normally do an out and back, park your car in the middle of the stretch that you run on and do two out and backs in each direction. That way, if you suddenly need to walk the whole way back to your car, you won’t be farther than 2.5 miles instead of 5 (on a 10 mile route example). And of course, always run with your phone so you can call someone to pick you up if something happens! Don’t Wear a GPS Watch on Race Day. I wore my Garmin during my first pregnant half marathon mostly because I also chose not to wear a timing chip (I was irrationally worried that someone would care to enough look up my time and know I was pregnant). However, the Type-A runner in me STILL looked at my watch. I created a goal for myself to not run a personal worst (my first half marathon was a 2:13) and didn’t fully let myself relax on the run course. However, at Zion, I ran watch free and it was SO much better. I still wore a timing chip so in the end I knew my pace, but during the race I could care less. I stopped three times for the bathroom, thanked the volunteers, chatted with fellow runners, stopped for photos and enjoyed every minute. There’s not point in caring about the clock while pregnant. I’m sure you can see the trend in all of this advice – every pregnancy is different and every day during your pregnancy will be different so there is no way to have expectations or goals. Be ok with walking up hills (or walking at any time!). Be ok with thinking you’re going to run 5 mile after work and instead heading straight for the couch for a Scandal marathon. Be ok with wasting time in long porto-potty lines during the race if you have to go. Be ok with getting passed by elderly women and people pushing double strollers. The only goal you should have for yourself while running during pregnancy is to keep you and your baby safe. And hopefully have some fun in the process! If you’ve raced while pregnant, what did you find that worked for you? If you’ve never been pregnant, do you think you’ll run races or skip them for the 9 months? During my first pregnancy, I ran the Goofy Challenge and the Princess Half at WDW. I didn’t really track running then but wasn’t too crazy with training then. I didn’t really follow the conversational pace rule, though, as my OB told me that as long as running wasn’t anything new and there wasn’t any pain, there was no need to change my running routine. It worked out well for me and baby faired well. This time around I’m in a better place running-wise. However, I decided to defer my races until next year because my marathon was set for October (1 month after my due date!). I also experienced SPD around 17 weeks which made Princess one of my worst race experiences pain-wise. I didn’t want to chance pain and long post-race recovery like last time. My longest race is 10K this time around which I’m completely comfortable doing. I found that investing in a Bao Bei Maternity belly sports bra has helped tremendously while running! I didn’t use supportive belts the first time around and I’m sure that aggravated my SPD. I started using one around 18 weeks this time around and it’s made a world of difference. I don’t feel the slight strain on my abdomen and pelvic/back pain doesn’t happen (it does when I run without it). It might be something worth looking into for long distances as your pregnancy progresses. Might save you from some aches and pains! Thanks Erica! I should get that band now! and congrats on your pregnancy! 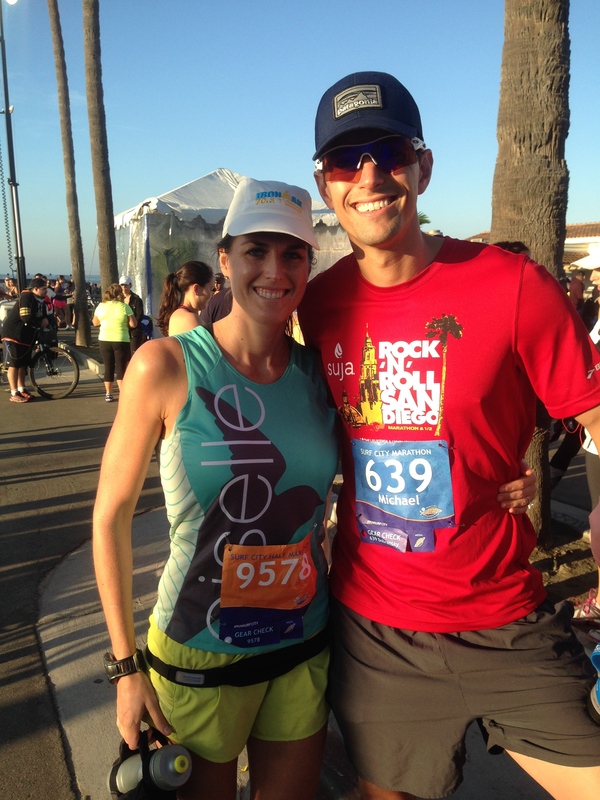 I ran Rock N Roll last year at 30 weeks pregnant. It took forever to finish because, like you, my pace went from an 8 min/mile average to an 11 min/mile average. I finished in 3 hours (my longest half ever). I just made sure to take my time, run when I felt good and walk when I didn’t. I made sure to hydrate a lot, and take in enough food while running. Luckily, they have a lot of bathrooms along the course 🙂 I think I stopped three times. I did also run with a belly band, which helped the bouncing from the belly. People were super supportive when they saw I was running while pregnant. Oh, if you have issues with overheating, a chilly pad works wonders. Good luck and just enjoy it!! Be proud you’re still running mama! Hey! I just saw your post in Mommy2Mommy. I just ran my first race — a half — since I ran Boston about 5 years back. I couldn’t understand why I crashed so hard at the 9ish mile mark until I realized the next day that I hadn’t gotten a period in awhile. Haha. Anyway, thanks for linking here. I was trying to figure out how much and how often I wanted to keep running. Glad it was helpful! Pregnancy definitely slows you down, even from the beginning. It’s crazy but so worth it. Enjoy every moment! I stumbled upon it this morning after having horrendous dreams last night in regards to a race I’m running this Sunday (23 weeks pregnant). I have raced throughout my pregnancy 10k/13.1 challenge; multiple 5ks and another 10k, but this half REALLY has me out of sorts mentally! My time has slowed down significantly and the circulation in my legs is driving me crazy. Lately I have been running without a watch so I don’t focus on time, I didn’t think about how important that will be on race day as well! Thanks for the tips, they helped to ease my mind as I was thinking about bowing out, not because I can’t do the race, but because I’m already unhappy with my time and it hasn’t even happened yet! You’re welcome! Just have fun and don’t put any pressure on yourself!! Just Googled “pregnant half marathon” and your post was on the first page! Pretty cool. I’m considering signing up for one. I’m 14 weeks now, and would be 22 weeks on race day. I’m going to see how the next few weeks go and I can sign up as late as race day weekend. Fun to revisit this post! That’s awesome! I think u can do it! I would have done it if I didn’t get sick. At least you won’t waste money if you can wait til then! Let me know!!! Thank you so much for your tips. They really explained and helped a lot. My plan is to do one half marathon while pregnant, as I signed up for it before finding out. Hopefully continue with the usual 6/7 km club runs. This past weekend I ran my first race in a very long time, I am really glad that I did, because that experience along with your article has led me to better prep for the half. I will only be about 14 weeks, so belly wont be do much of an issue, but the mentally being slower part and the overheating! Obviously most people who hear that I am still running the half give me a gasp and big eyes…I then say I plan to walk/run an hopefully make it before the cut off. Thank you again, this was a real encouragement with great advice. Glad it helped! If you are already a distance runner, running a half marathon while pregnant isn’t going to hurt the baby at all! Dedicating your race to the angel babies is a great idea. Thanks for this article, I realize it’s an old post I was just reading up a bit after I’ve received some concern from those around me. I’ll be running the half in the Houston Marathon this weekend at 24 weeks pregnant. I changed the distance from full to half when I found out we were expecting. 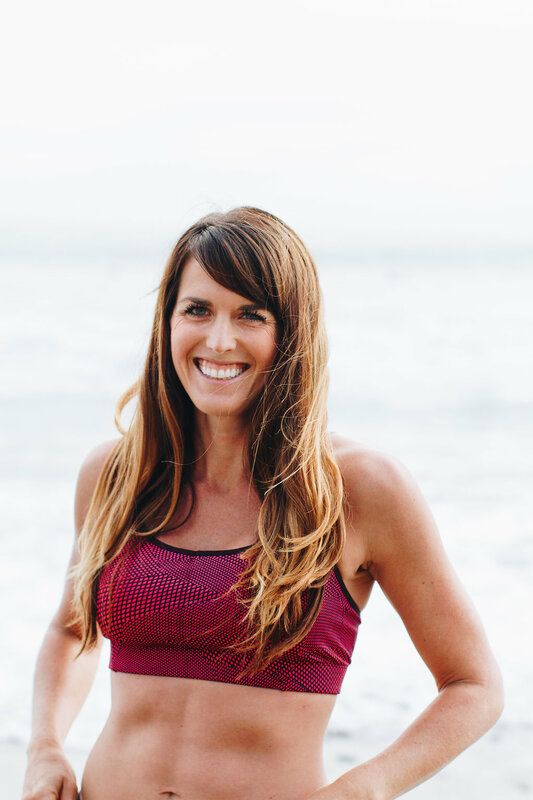 I ran consistently through my first pregnancy until 36 weeks, though only my usual 6 mile loop 3 times a week, and found it very helpful to be fit during labor and immediately postpartum. Funny, my training schedule has been just like you described! Very low key, no expectations. I ran 10 miles a month ago and it felt great, ran another 10 miles last weekend while pushing a running stroller and it was no problem at all. Of course I’m not planning to push the pace, I couldn’t if I tried. My goal is to have fun and stay healthy for our new baby girl! It’s good to hear others do the same. And even this weekend, if I start to feel something isn’t right or that I need to stop, I will. It’s actually a blessing in disguise, since I’ll be finishing before my husband now (he’s doing the full) I can pick up my son and we can meet him to celebrate together at the finish line! Race day is our wedding anniversary, woohoo! I am so glad it helped! And congrats on your pregnancy and anniversary! Thanks for the advice. I am currently at 8 weeks pregnant. On Oct. 28 I will be running in my 4th half marathon. My runs have gradually started decreasing in speed and increasing in time. This past Saturday I ran 11 miles in the time that it took me to run my last half marathon. I don’t feel quite as bad after reading your advice and the advice of other people about taking it easier when training for this half. Congrats on your pregnancy! Glad this was helpful and good luck at the race!!! I just completed Rock N Roll Savannah this past weekend at 5 weeks pregnant. I even got a PR! Thank you for your advice. I will be running another one in January and March. I know my time will slow and I am OK with that. I am always so focused on my time so maybe being pregnant will help enjoy the race and courses! CONGRATS!That’s incredible and super exciting! And congrats on your pregnancy! It’s such a wonderful time! And yes, being pregnant does allow you to experience the races in a totally different light! 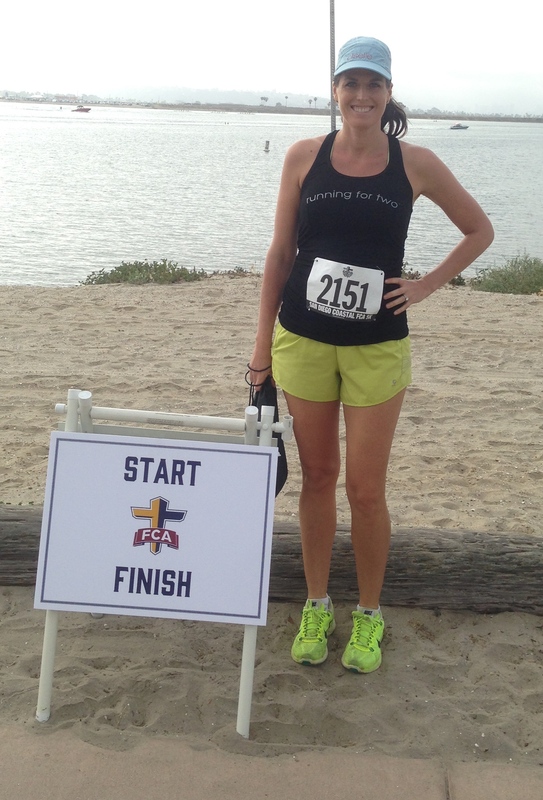 At 16 weeks pregnant I ran the Long Beach Half with no expectations and was just happy to finish! 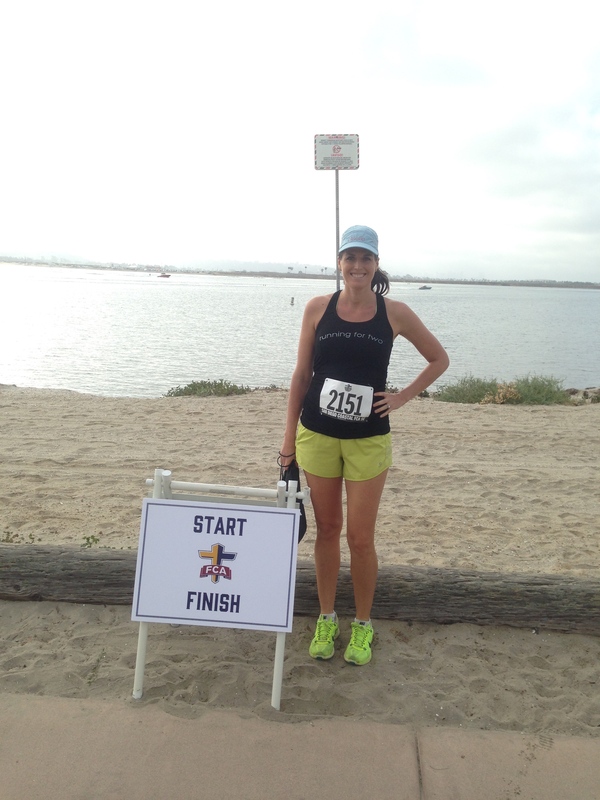 I’ve been completing the Beach Cities Challenge for the passed 7 years or so and had already signed up for LB before I was pregnant. It was tough with new muscle sensations in my abdomen and some leg cramping but I’m so glad I did it. Tomorrow, I have a Holiday Half Marathon and I’ll be 28 weeks. At this moment, I’m only 75% sure I’m going to do it! ? Thank you for your positive posts and writing because everyone has been so negative about it that it’s giving me anxiety. I always Galloway (run – walk) but now I’m nervous about eating during the race (where to stash snacks?!) and being able to find bathrooms when needed. We shall see! Thank you again for your post! Did you end up running! ?